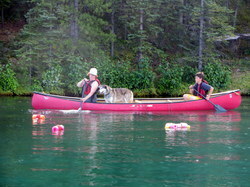 Flatwater North Sprint Club is a member of the Yukon sport governing body: Flatwater Paddling Yukon. As the governing body, Flatwater Paddling Yukon's goal is to encourage participation and develop excellence in the sport of canoe and kayak and to enable participants to realize personal excellence. Flatwater North oversees the activities and programming related to Sprint Racing (flatwater), to enable athletes to compete competitively in the sport of canoe kayak.